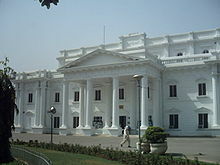 Lahore (Urdu: لاہور‎) is the second biggest city in Pakistan. It is the capital of the province of Punjab. It is also known as the 'City of Gardens' because of its many parks and gardens. This city is known for its rich culture and lively atmosphere. Pakistan's major Urdu film industry Lollywood is based here at the "Cultural Heart of Pakistan". It is 60 km (35 mi) west of Amritsar, India. It has a semi-arid climate (BSh in the Koeppen climate classification). According to legend, the city was founded thousands of years ago by Lava or Lav, son of the deity Rama (hero of the Ramayana). Its original name was either 'Lav-garh' (Fort of Lav/Lava) or 'Lavapuri' (Place of Lava/Lav) which was later changed to 'Lavhur' or 'Lahor' and then 'Lahore'. According to historians and archaeologists, Lahore was the capital of several Hindu dynasties from around 300-250 BC onwards. Probably the first of these dynasties was the 'Loh'(or Lav) dynasty of the Gujar tribe. Some people also believe that this city is the same one mentioned by Ptolemy in his Geographia. The ancient 'Walled City' was the old, proper Lahore, which later expanded in different directions. Quite a lot of work was done on it by the kings of the Delhi Sultanate and then the Mughals. Most of the newer areas and suburbs of the city are from the later British Raj from 1849 to 1947. Lahore is historically an important place in the South Asian Subcontinent. Famous buildings made here during the time of the Mughal Empire include the Badshahi Mosque, the Lahore Fort and the Shalimar Gardens. It was capital of the Sikh Empire of the early 19th century. Many of the city's old artifacts and historical treasures over the ages, can be seen at the famous Lahore Museum built later in the 19th century during British Indian rule. Lahore is also important due to its role as a center of the Pakistan Movement later, and the famous Lahore Resolution of 1940 was passed here by the Working Committee of the All-India Muslim League, which eventually led to the making of an independent state of Pakistan in 1947. This event is commemorated by the Minar-e-Pakistan building in Iqbal Park. To the north of Lahore, near the Ravi River, lies the old suburb of Shah Dara, which is also considered to be historically significant, as the tombs of the Mughal Emperor Jahangir and his wife Nur Jahan, are situated here. According to the early English traveler, Thomas Coryat, who visited Lahore in its 'Golden Age' during the reign of Jahangir, it was probably the finest city in the world at that time, and 'exceedeth evene Constantinople in greatnesse' (It was even greater than Constantinople). Lahore is Pakistan's top educational center. The old University of the Punjab has two campuses in the city. Other old and famous institutions of higher learning include the Government College University (GCU), the Forman Christian College and the Kinnaird College for Women. The National College of Arts, a specialized fine arts institute, is also located here. The city is also home to Pakistan's most prestigious high school and college, the Aitchison College Lahore. Other institutions include the Central Model School, St Anthony's School, the Beaconhouse School System, Lahore College of Arts and Sciences (LACAS) and the Lahore Grammar School. Lahore is Pakistan's cultural, literary and artistic heart. It has some of the best food in the whole Indian subcontinent at the Gawalmandi Food Street, near the old Walled City; and several notable cultural centers like the Alhamra Theatre, the Punjab Arts Council, the Lahore Museum, the Shakir Ali Museum, the Fakir Khana museum and the Rafi Peer Theatre Group. The Lawrence Gardens, Lahore are another site from British times that is worth visiting. The famed Heera Mandi in the old Taxali Gate area is also a part of Lahore's historic culture. The Anarkali Bazaar is also a great place for traditional shopping. Lahore is also important in Pakistan as a center of cultural and religious tolerance. The city does not have many religious fanatics or extremists, unlike some other parts of this country. The main reason is because of the strong influence of many famous Sufi saints who lived here in the past. The shrines (burial places) of some of them are still visited by many people. The shrines of Hazrat Daata Sahib and Mian Mir Sahib are specially famous. Griffin and Massey, Chiefs and Families of Note in the Punjab, revided edition 1910-11. WG Osborne, The Court and Camp of Runjeet Singh, London, 1846. Lady Emily Eden, Up the Country, new edition, London, 1983. Hakim Ahmad Shuja, Lahore ka Chelsea (Urdu), Lahore, 1969. Ian Talbot, Divided Cities: Lahore and Amritsar:1947-1957, Karachi, 2005 edition. FS Aijazuddin, Lahore: Illustrated Views of the 19th Century, Lahore, n.d.
WJ Glover, Making Lahore Modern: Constructing and Imagining a Colonial City, Karachi, 2011. B. Gascoine, The Great Mughals, London, 1971. M. Athar Tahir, Punjab Portraits, Lahore, 1992. Isobel Shaw, Pakistan Handbook 1988. This page was last changed on 4 April 2019, at 13:59.